If you’re growing squash in containers, you’ll need a deep planter box, a large (15-30 gallon) pot, or a half-barrel and a rich potting soil to have any success. Squash are thirsty plants and heavy feeders, challenging to grow organically in the limited root zone of a pot. ‘Raven’ zucchini growing in a 15-gallon pot. Choose compact bush squash varieties for the best results. 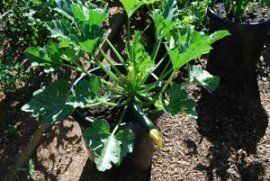 ‘Bush Baby’ and ‘Raven’ are good zucchini varieties for containers. ‘Sunburst’ and ‘Starship’ are good candidates for patty-pan squash. Fruit size, density, and yields are generally smaller for container-grown winter squash. ‘Discus Bush Buttercup’, ‘Bush Delicata’, and ‘Honey Bear’ acorn are the best varieties to try. Both the vines and the fruit of winter squash grow larger than their summer squash cousins, so they’re harder to grow in containers. If you're growing squash in containers, you're going to need a large pot or wooden planting box. Half-barrels make great containers for growing squash, but they're very heavy and hard to move. A 30-gallon fabric Smart Pot is an excellent, light-weight alternative that gives you enough soil volume for squash. A large soil volume makes the plants more resilient, and less likely to dry out as quickly. Squash are thirsty plants and will need daily watering to maintain fast growth and steady fruiting in containers. I always build slow-release organic soil amendments like good compost, worm castings, alfalfa meal, feather meal, and greensand into my potting mix before I plant (see Fertilizing Container Vegetables for more information). To learn more about organic soil amendments, see the Organic Fertilizers page. For most people, it's simpler and cheaper to use a good, balanced organic fertilizer like Dr. Earth Organic Tomato, Vegetable, and Herb Fertilizer . You can mix some into the potting soil when you plant, and top-dress with a little more 6 weeks later for a mid-season boost. If you have access to a worm bin, add ½-gallon of fresh worm castings–including worms–to the potting mix. The worms add beneficial bacteria and fungi to the potting mix, and help convert organic soil amendments into plant-available form for your vegetables. See Growing Vegetables in Containers for more information on vegetable container gardening.